Try a trial version of ArtRage 5, with no signup, expiry, risk or obligation. ArtRage 5 is the full professional edition of ArtRage with all features and tools. Whether you are comparing digital painting programs, considering switching from traditional to digital real media, or considering upgrading from a different edition of ArtRage, the free demo allows you to try the features of ArtRage 5 for an unlimited time. Note: The demo version does not allow you to save files. Learn more about ArtRage 5 or compare the features of our different editions. When you launch ArtRage, you can find a Quick Start guide in the Help menu, but if you have any questions, please feel free to contact us! Click on the download links on the right to download the demo directly to your computer. To choose the location that it saves to, right click and choose “save as” instead. Once you have downloaded the file, double click it and follow the instructions to install the demo. If you are installing the macOS version, make sure to drag the ArtRage program to your Applications folder to finish installing. If you choose to purchase the full program, you will need to download it separately (the demo does not turn into the full program). We respect your privacy and do not require an email sign up or internet connection to install or use ArtRage 5. There are no ads inside the program, and we do not track user activity. The ArtRage 5 demo version does not allow you to save, export, or record scripts. All other features are fully functional, and any custom resources you create will be usable in the full program if you choose to purchase it. There is no time limit on the demo software, so you can take your time to explore the tools without worrying about a deadline! We offer downloads for both Windows and macOS, but you need to download the correct version for your computer. Purchasing ArtRage 5 allows you to download both macOS and Windows versions whenever you need them. Windows: ArtRage 5 is fully compatible with Windows Vista, 7, 8 and 10.
macOS: ArtRage 5 is compatible with macOS 10.8 and later. You can install ArtRage 5 on any desktop, laptop, or touchscreen device that runs a supported operating system. You do not need a powerful computer or graphics card. ArtRage 5 is compatible with standard graphics tablets drivers. ArtRage 5 is available in English, French, German, Dutch, Spanish, Italian, Japanese, and Russian. 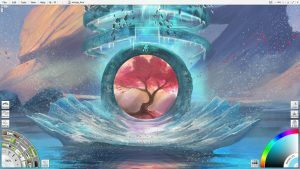 ArtRage 5 should automatically detect the language that your computer uses when installing. If this does not happen, you can change the language inside the program by going to Help > Change Language. Thank you for trying ArtRage, we hope you enjoy painting! Requires: Windows Vista, 7, 8, or 10. Instructions: Download the installer using the button above. Once you have downloaded the file, double click it and follow the instructions to install the demo. Requires: Mac OS X 10.8 or later, Intel Processor. Instructions: Download the disk image using the button above. Once you have downloaded the file, double click it and drag the ArtRage 5 Demo icon to the Applications folder icon. ArtRage 5 contains natural painting tools like oils and watercolor, sketching tools like pencils and ink pens, and utilities to make painting easier. Here you can find an online manual with instructions on how to install, activate, and use your copy of ArtRage. This is for the full version, but can still apply to the demo (you don’t need to activate). If you require any support when using or attempting to install ArtRage, or technical questions relating to the product and its features. Interested in making the most of ArtRage and exploring it’s many features? Try your hand at some ArtRage tutorials.